Codfish is a low-fat, nutrient-dense food that can provide you with many health benefits. In addition to being a good source of protein, vitamins and minerals, the omega-3 fatty acid content has been proven to help prevent common chronic diseases. 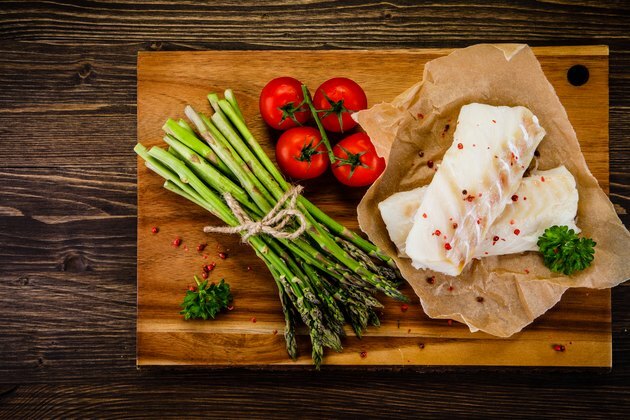 Wonder no longer whether cod is a healthy addition to your diet; the overall nutritional advantages of eating cod definitely outweigh any potential food safety risks. Cod is low in calories, low in fat and saturated fat, and low in sodium compared to other animal-protein foods. Including cod in your diet may help protect you from cardiovascular risk, arthritis and Alzheimer's disease. Cod is a mild-tasting white fish with pearlescent flesh. The two species of codfish inhabit different oceans. Pacific cod are found in abundance in the Pacific Ocean near Alaska, Canada and Japan, while Atlantic cod live in the cold, deep waters of the North Atlantic. Atlantic cod is a larger fish with a somewhat sweeter flavor than Pacific cod. It's typically the kind you might have had with fish ‘n' chips and is the most commonly eaten type. The FDA recommends replacing some meat or poultry with two to three servings of fish per week — about 3.5 ounces per serving. Consuming about 8 ounces of fish per week will provide an average of 250 milligrams per day of omega-3 fatty acids, which is associated with reduced risk of heart disease and may help improve inflammatory conditions, says the National Institutes of Health. There are a few nutritional differences between Pacific and Atlantic cod, and for this analysis, 100 grams, around a 3.5-ounce serving — a palm-size portion — of fresh raw Atlantic cod will be used. Dietary Guidelines for Americans recommends a daily intake of between 1,600 to 2,400 calories for adult women and 2,000 to 3,000 calories for adult men, depending on age and gender. Compared to salmon, Atlantic cod is lower in calories because cod is a lean fish. In fact, cod is lower in calories than meat, chicken and many other types of oily fish. Raw cod contains only 82 calories per serving, so it won't contribute a lot to your daily allowance. If you cook your fish breaded or in butter, the caloric content will be higher. Cod has no carbohydrates, making it an ideal addition to your low-carb diet. However, that means that it doesn't have dietary fiber. Be sure to include lots of fiber-rich vegetables or a salad with your fish meal. With 54 milligrams of sodium, providing 2 percent of your daily value (DV) per serving, cod is considered low in salt. Dietary Guidelines for Americans recommends that you limit your daily salt intake to 2,300 milligrams a day. Codfish is exceptionally rich in phosphorus, with 203 milligrams supplying 20 percent DV per 100 grams. Phosphorus is needed for energy and works with calcium to help build your bones. Selenium is important for the function of your thyroid and for DNA production and also protects your body from free radicals. Codfish supplies 47 percent DV of selenium per serving. Cod is also a good source of potassium and magnesium, supplying 9 and 8 percent DV, respectively. Other minerals in cod are iron, zinc and calcium. Cod is rich in B vitamins, especially vitamin B12, with 0.9 microgram or 15 percent DV. Other B vitamins in a serving of cod include 12 percent DV for B6, 10 percent DV for niacin, 5 percent DV for thiamin, 4 percent for riboflavin and 2 percent for pantothenic acid. Your body needs the B group of vitamins for vital physiological functions, including the maintenance of cells, nerves, brain function and the formation of red blood cells. Cod provides 9 percent DV for vitamin D that aids in calcium absorption for the health of your bones. Cod liver oil is one of the richest food sources of vitamin D and is used extensively in supplements. In addition, cod contains the antioxidants vitamin C and E to support your immune system. Protein plays an essential role in your body for the repair, maintenance and growth of your bones, muscles, cartilage, skin and cells. Men should strive for 56 grams, and women need 46 grams of protein daily. Fish is packed with protein, and cod offers 18 grams <ahref="https: health.gov="" dietaryguidelines="" 2015="" guidelines="" appendix-7="" "=""> </ahref="https:>and an average of 36 percent DV in just one serving. The protein in cod is a complete protein, offering all of the essential amino acids your body can't produce on its own. The unique combination of high-quality protein in cod was examined as part of a study published in Nutrients in 2018. Researchers observed that people who ate cod had a greater and more prolonged satiety level compared to participants who consumed beef or chicken. Cod is a lean fish and contributes only 1 percent DV of fat with 0.7 gram per serving. The amount of saturated fat is negligible but, with 43 milligrams of cholesterol —14 percent DV — it may be a concern for some people. The USDA hasn't set a limit on the amount of cholesterol you should include in your diet but, if you have a cardiovascular disease, it's recommended you restrict your intake. Codfish contains heart-healthy monounsaturated and polyunsaturated fats (which contains omega-3s) that may help moderate heart rhythm, lower your blood pressure, balance your cholesterol and decrease the risk of heart disease, says Medline Plus. The recommended daily intake for omega-3 fatty acids differs according to age and gender. Adult men need 1.6 grams and adult women need 1.1 grams — more if they're pregnant or lactating. Omega-3s play an important role in your body, performing functions such as maintaining the cardiovascular, pulmonary, immune and endocrine systems. It's the nutrient primarily responsible for the reputation fish has for being heart-healthy. Can Cod Prevent Alzheimer's Disease? Alzheimer's disease is usually an age-related condition that results from degeneration of the brain and mental deterioration. Studies have shown that consuming fish may have a positive effect on reducing the development of Alzheimer's. Researchers at the University of Pittsburgh found that those who ate fish just once a week had a lower risk of mild cognitive impairment, which often leads to Alzheimer’s. The 2014 study tracked 260 men and women who didn't have Alzheimer’s or any serious memory problems. Each participant ate fish one to four times a week. Over a five- to 10-year period, MRI brain scans revealed a greater preservation of brain matter in areas such as the hippocampus, which is critical for memory. Results showed an almost fivefold reduction in the risk of Alzheimer's or cognitive impairment associated with the consumption of fish. The study's conclusion, published in the American Journal of Preventive Medicine, recommended eating baked or broiled fish as part of lifelong healthy eating habits for brain-protective benefits. Of note, fried fish did not provide the same results. Is Cod Good for Joints? Rheumatoid arthritis is a progressive autoimmune condition that causes inflammation in the joints and may result in painful deformities and immobility, especially in the fingers, wrists, feet and ankles. Consuming adequate amounts of cod or other fish may be associated with managing the joint inflammation of rheumatoid arthritis. Reports of a study published in the medical journal Arthritis Care & Research concluded that the more fish you consume, the better your control of arthritis. Researchers compared the effects of consuming nonfried fish in 176 people with rheumatoid arthritis. Findings were that those who ate more than two servings of fish per week had the most positive effect on controlling their arthritis. Heart disease is the leading cause of death for both men and women. Centers for Disease Control and Prevention says that about 610,000 Americans die of heart disease every year. It's well-known that eating fish has a positive impact on heart health. In 2018, Nutrients published a study that examined the nutritional contribution that fish consumption has on cardiovascular disease and metabolic syndrome. Metabolic syndrome is an indicator of health problems that often result from excessive fat around the waist, elevated blood pressure, high triglycerides and low HDL cholesterol. These problems increase your risk of heart attack and stroke. The study based its evidence on past research. Both fatty fish and lean fish (cod) were used in the analysis. Researchers found that fatty fish has a higher level of omega-3 fatty acids and vitamin D, while lean fish has more iodine and taurine. Taurine suppresses inflammation and has been found to lower blood pressure. Iodine is required for thyroid function, and cod contains 10 times more iodine than fatty fish like salmon. Conclusions from the study, published in the journal Nutrients, suggested a relationship between the consumption of fish and reduction of heart disease leading to stroke and sudden coronary death. The recommendation was to include lean fish, like cod, in your diet as a source of protein, vitamin D, iodine, selenium and taurine, all of which were found to have properties that target the risk factor of cardiovascular disease. As in other perishable foods, microorganisms in fish can lead to illness caused by naturally occurring toxins. Adverse reactions to eating cod may be due to improper harvesting, handling, storage or preparation. Fish that is eaten raw or partially cooked represents the highest danger. Other risks associated with environmental contaminants may result from eating fish from water contaminated by pollutants. Always check the source of your fish before eating it. Are There Dangers From Contaminants? Conflicting information often causes concern about mercury and dioxin accumulation in fish. Mercury is naturally present in the environment as a result of volcanic activity and rock erosion and accumulates in the ocean due to industrial pollution like manufacturing and mining. Almost all fish contain at least some level of contaminants and toxins. However, according to the American Institute for Cancer Research, the contaminant levels are too low to cause harm if eaten in accordance with government guidelines. And according to a report in Nutrients, which examined the combined data of health benefits versus contaminant exposure, researchers are in agreement that two to three servings of fish weekly override any potential health risks. Read more: What Are the Health Benefits of Eating Fresh vs. Frozen Fish? Should Pregnant Women Eat Cod? Women who are pregnant often limit the amount of fish they eat due to concerns over the potential danger of mercury. But research shows there's little need for worry. A 2016 study evaluated the effects of mercury levels in pregnant women with emphasis on the outcome of their babies. Findings, published in the International Journal of Hygiene and Environmental Health, showed no negative effects in birth weight, head circumference, height or risk of preterm delivery with the women who ate fish and had moderate mercury blood levels. In fact, the results of the study established that fish consumption may have a protective health benefit to the newborn. Women were encouraged to eat at least two portions of fish per week during pregnancy. The FDA concurs, stating that fish, as a protein source, can help your child’s growth and development. Women of childbearing age — 16 to 49 — should eat two to three servings of fish a week. Cod is listed as one of the best choices. In addition, children 2 years of age and older should consume one to two servings of fish a week.